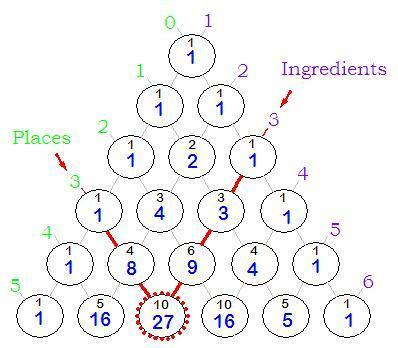 Note that the small black "Ratio" numbers are identical with the numbers of Pascal's Triangle. The larger blue "Permutation" numbers follow a simple pattern. The diagonal line from a particular Ingredient Number contains all the powers of that number from 1 to as far as the triangle is extended. For example the 2 Ingredient Line contains all the powers of 2 ie: 1,2,4,8,16,32...etc and the 3 Ingredient Line contains all the powers of 3 ie: 1, 3, 9, 27, 81...etc. The diagnal line from a particular Place Number contains all the numbers of a particular power from 1 to as far as the triangle is extended. For example the 2 Place Line includes all the Square Numbers ie: 1, 4, 9, 16, 25...etc and the 3 Place Line contains all the cube numbers ie: 1, 8, 27, 64...etc.